The loss of a "nuclear" bomb off Puerto Rico during WWII brings strange consequences to a stressed community in Washington State decades later. In the Skagit River Valley, gateway to the pristine Pacific Northwest wilderness, vegetation, birds, and people are inexplicitly dying. One elderly bully's spiteful lies have trapped her victims in a toxic web. A long-standing spat over property rights threatens to escalate into a fight involving all of Concrete, Washington, as unexplained events raise suspicions about long-buried secrets. Power is something that Molly McCain craves, and she will destroy anything standing in her way to get it: her family, her neighbors, and the environment. JoAnne, a former World War II pilot is wheelchair-bound from a youthful accident involving sinister secrets. Maria, JoAnne's niece and a professional pilot, masks the unresolved pain of childhood abandonment. Spencer, a young organic vintner, suspects the rich valley soil has been polluted by undocumented wastes. Russell, a spunky 95- year- old ham radio buff, intercepts curious messages that provide clues to the decades-long cover-up. 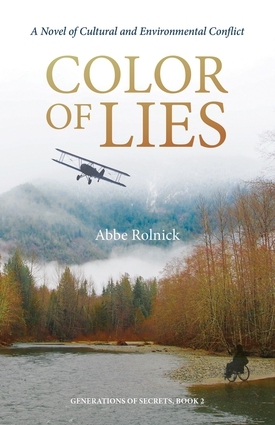 Lies, even the little white lies told to protect themselves and each other from the past, suddenly conspire against them as the valley's secrets unravel. Threatened with exposure, the perpetrator resorts to more malicious behavior, and her victims must join with the community to stop her and save the valley.